It is the most ironic ruin of Detroit. Nowhere is the automobile more triumphant than here. Yet this site contains a double irony for it here that Henry Ford created his first car in a tiny shop that once stood on this site. Among the many dominoes to fall with the near death of downtown Detroit in the 1970's and 80's was the lavish Michigan Theater. 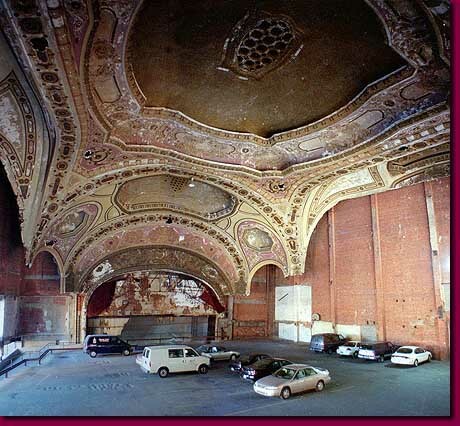 The demise of this once mighty downtown movie theaters arose, in large part, from the inability to compete with the newly emerging suburban movie theaters and their acres of free parking.